Visible symptoms of clubroot have been confirmed in 37 Saskatchewan canola fields across the northern agricultural regions to date. 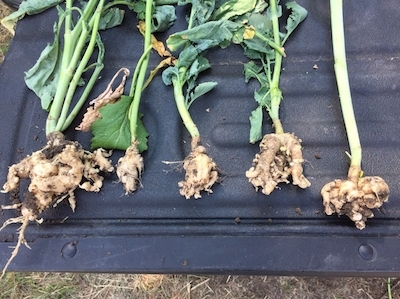 Clubroot symptoms (galls on the roots of infected plants) were identified in three more crop districts this year. The most recent findings show confirmed symptoms of clubroot have travelled south beyond fields in northwestern and north central Saskatchewan, appearing as far south as the Saskatoon area. The area where clubroot has been confirmed has expanded outside of crop districts 9AE, 9AW and 9B (2017 findings) to include crop districts 7B, 6B, and 5B. Fields with visual symptoms were identified either through the clubroot survey or were reported to the Ministry of Agriculture by Saskatchewan growers, agrologists, or rural municipalities. All growers will be contacted and advised to follow the protocol outlined in the Saskatchewan Clubroot Management Plan. “It is unlikely that the clubroot pathogen is isolated to infected fields,” Barb Ziesman, provincial plant disease specialist, wrote when new findings of clubroot appeared in 2017. Spores of the clubroot-causing pathogen can be present in a field at low levels without the development of symptoms. At the time clubroot was confirmed in crop districts 9A and 9B, Ziesman encouraged canola producers in those districts to scout for clubroot and begin implementing proactive clubroot management strategies on their farm. Clubroot is a disease that’s best managed by being prevented. Once the pathogen is introduced, early detection will enable the implementation of management practices that will keep spore levels low and reduce the risk of disease development and yield losses, Ziesman writes. Clubroot management strategies for producers are detailed in a 2017 resource entitled New Findings of Clubroot in Saskatchewan: What does this mean for you? In response to clubroot detections in the fall of 2017, and to better understand the scope of clubroot in the province, the Saskatchewan Ministry of Agriculture led an extensive clubroot survey in 2018. The in-field portion of the survey recently concluded, and soil testing is underway at the laboratory, which will provide additional information about the distribution of the clubroot pathogen. Once testing is complete, a clubroot distribution map will be released by early 2019 to raise awareness of the distribution of clubroot in Saskatchewan. If clubroot is found outside of the survey, growers and agronomists are asked to contact the Ministry before the end of the year so that additional locations can be added to the map to ensure it is as representative as possible. Specific locations of fields with clubroot presence will not be shared publicly. As Saskatchewan growers complete post-harvest field work and formalize their seeding plans for 2019, it is important they consider growing clubroot resistant varieties and extending their crop rotation, remain vigilant about minimizing soil movement and scouting their own fields for clubroot. For more information about clubroot and its prevention and management, canola growers can visit clubroot.ca or contact their local Canola Council of Canada Agronomy Specialist, the Provincial Plant Disease Specialist, or the Agriculture Knowledge Centre at 1-866-457-2377.